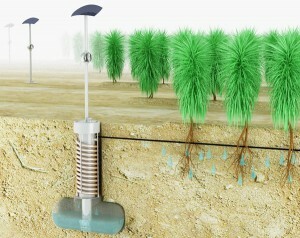 This week the winner of the 2011 James Dyson Award (named for the high-tech vacuum guy) was announced. Edward Linacre from Australia was chosen from over 500 entries for his Airdrop irrigation system, an original low-tech solution to one of the world’s major problems: drought. After witnessing Australia’s worst drought in a century, Linacre came up with his idea by studying the Namib beetle. This desert-dwelling insect is able to collect condensation from the morning mist on its back, a unique survival skill that allows it to live in one of the world’s most arid areas. Linacre’s solar powered Airdrop mimics this method of collecting water by pumping air into its underground piping system, where it cools to create condensation. 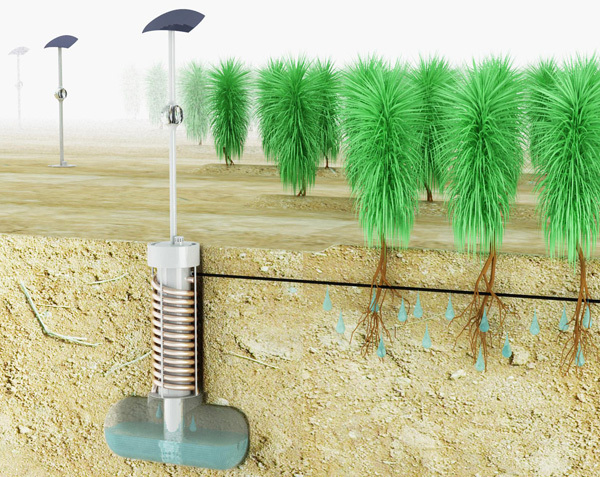 The water collected is then distributed directly to the roots of nearby plants. In a dry area in which one prototype was tested, over a liter of water was collected from thin air in a single day. Architects, designers and engineers have been using biomimicry since Leonardo da Vinci looked at birds and sketched out ideas of possible flying machines. Sir James Dyson said, “Airdrop shows how simple, natural principles like the condensation of water, can be applied to good effect through skilled design and robust engineering.” It is hoped that the £10,000 prize money will help fund the development of an improved industrial prototype of the Airdrop that can be used on a larger scale. Eventually this technology could help bring irrigation water to drought-stricken farmers in rural Australia and other desert regions throughout the world.